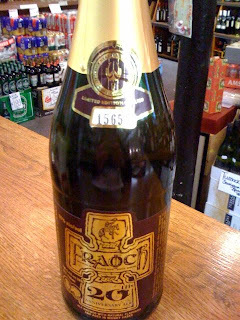 Fraoch 20th Anniversary Ale by The Williams Brothers is their celebration of 20years of successful brewing. This is a limited edition ale of which they produced 7,500 bottles. Deveney's of Dundrum have 5 - left. I've sold a few and sacrificed one for this post. It's a heather ale matured in single malt whisky cask. These Whisky casks, like most Single Scottish Malts and more recently Irish Whiskey, were previously Sherry cask, originating from Jerez in Spain. The particular cask used to lager this Ale stored a single malt Speyside Whisky. Speyside tends to be a very aromatic style of Whisky and sits somewhere between the softness of a Highland and the saltiness of an Islay. Fraoch 20th pours a dark golden colour with a thin white head. The nose is really complex displaying typical Sherry characteristics - nutty, dry white wine with some caramel and yeasty notes. The palate has loads of layers. Dried fruit - raisin, honey, slightly peaty and a nuttiness that's really pleasant against a semi-sweet backdrop. This is 11% and only available in a 750ml so it's pretty important to remember on consumption that its the same volume and close to the alcohol content of a bottle of wine. I only drank the regular bottle, which I've always liked, I've put this in teh stash cupboard for a special occasion. Terrible I know. if you've any left I might "create" special occassion and replace it!!! !